Canvio 3.0 Plus products have been designed and manufactured in accordance with Toshiba’s high quality product standards, incorporating the latest technology and user-interface, while ensuring best-in-class performance, quality and workmanship. With Toshiba’s Canvio 3.0 Plus Portable Hard Drives, you’ll enjoy portable storage space for even the largest digital libraries. 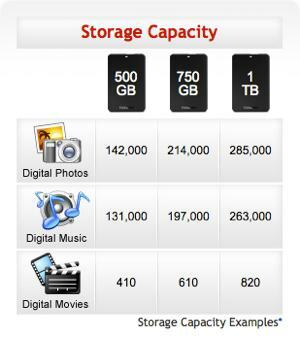 Our 1.0TB Drive is capable of storing up to: 285,000 digital photos, or 263,000 digital music files, or 820 downloaded digital movies. Each Canvio 3.0 Plus Portable Hard Drive includes an internal shock sensor and ramp loading technology to help keep your drive safe. Canvio 3.0 Plus Portable Hard Drives are preloaded with software to make backup fast and simple. The included NTI Backup Now EZ software scans your system and recommends the best coverage for your computer. Choose between backing up your files to the cloud, backing up your files and folders to your Canvio 3.0 portable hard drive, backing up everything saved on your computer, or choose all three for the most comprehensive coverage. Click the restore button and you can recover a file or folder. Boot to your Canvio 3.0 Plus Portable Hard Drive and it will restore all the files saved on your computer. We’ve even included a utility to burn a boot CD/DVD to make the process even simpler. Secure your backup files with password-protected data encryption, (up to 256-bit), to help keep your backup safe and prevent unauthorized access. Options include the ability to select only the most common file types, (like work documents, pictures, movies, music, etc. ), change how often your backup takes place (hourly, daily, weekly, etc.) and change the threshold settings on the Drive Space Alert. 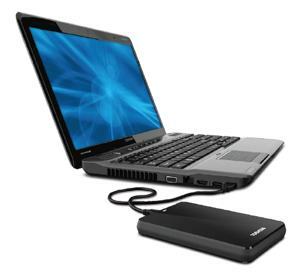 Toshiba Canvio 3.0 Plus Portable Drives are compatible with Windows 7, Windows Vista and Windows XP. For over 20 years Toshiba has been developing and manufacturing hard drives used by every major brand of notebook computer. 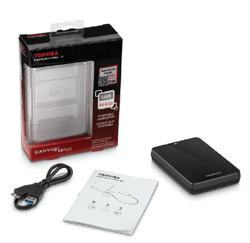 If you want a smarter way to preserve your most precious digital files and memories, Toshiba’s “brainy” Canvio 3.0 portable hard drive offers a complete system backup solution in a box. It requires no external AC adapter and it’s Plug & Play compatible. Just connect it into the USB port of your PC and you’re good to go (learn more about backups below). The Canvio 3.0 in black (view larger). Future-proofed with USB 3.0 technology, the Canvio 3.0 hard drive significantly improves file transfer speed for large media files and dramatically minimizes the wait time for backup and recovery processes. Plus, it’s backwards compatible with USB 2.0 devices. Additionally, each Canvio 3.0 portable hard drive includes an internal shock sensor and ramp loading technology to help keep your drive safe. This version of the Canvio 3.0 portable hard drive has a 1 TB storage capacity, and it comes in black. 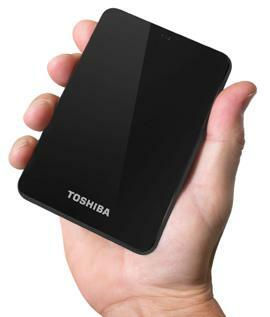 Toshiba Canvio 3.0 portable hard drives are compatible with Windows XP, Windows Vista, and Windows 7. 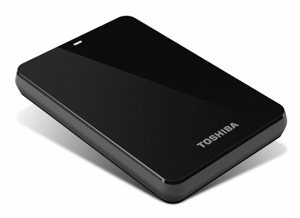 Toshiba’s Canvio 3.0 portable hard drives deliver one of the easiest ways to add storage to your computer. One of the simplest storage solutions in a box, they offer plug-and-play, drag-and-drop convenience. Put your backups on the cloud and your concerns on hold. Toshiba’s latest Canvio 3.0 portable hard drives come with integrated cloud backup capabilities that simplify taking advantage of this latest innovation (free 30-day trial of cloud backup included). Offering a built-in internal shock sensor and ramp-loading technology, Canvio 3.0 portable hard drives help safeguard your data against accidents, drops and unfortunate real-life scenarios. Powered by new USB 3.0 technology, Canvio 3.0 portable hard drives are far faster than–but still compatible with–USB 2.0 technology. Just plug them in, load the software and start protecting your data. Canvio 3.0 portable hard drives are packed with famous Toshiba innovation, tested thoroughly for reliability, and backed by a three-year limited warranty. Easy backups with NTI Backup Now EZ software. Back up your files to the cloud. Back up your files and folders to your Canvio 3.0 portable hard drive. Back up everything saved on your computer. Or, choose all three for the most comprehensive coverage. Click the restore button and you can recover a file or folder. Boot to your Canvio 3.0 portable hard drive and it will restore all the files saved on your computer. Toshiba even includes a utility to burn a boot CD/DVD to make the process even simpler. Secure your backup files with password-protected data encryption, (up to 256-bit), to help keep your backup safe and prevent unauthorized access. The Drive Space Alert monitor will keep an eye on your drive and let you know when it is getting full. For advanced users, Toshiba’s added the ability to customize your backup routine. Options include the ability to select only the most common file types, (like work documents, pictures, movies, music, etc. ), change how often your backup takes place (hourly, daily, weekly, etc. ), and change the threshold settings on the Drive Space Alert.